Thank you very much everyone for the expressions of support. I really appreciate it. On the music from LibertyRansom: Thank you very much for the offer to help in the music department. I've listened to 'Skirmish at the Edge of the Badlands' several times and I think it's really awesome! I will message you and you can also write to enquiries@heroicfantasygames.com. Of course, I would love to have that soundtrack and others from you in KotC 2. Me see, me takes! We wants it! We needs it!! * Dialogue portraits: I have just reintroduced the portraits that were displayed in the top-left corner when you were talking to someone in KotC 1. In KotC 2, there are nearly 300 portraits to choose from. Item icons can also be displayed there. * Weapon enchantments: All weapon and armour enchantments are now implemented. The most complicated one was Dispelling. On a successful hit, the Dispelling weapon enchantment attempts to remove a beneficial magic effect affecting the target. As with every combat action in KotC 2, the percent chance of success is displayed in a tooltip when you mouse over a target creature, as well as the name of the magic effect that may be removed. The damage range is also displayed. * Potions: I've added potions to the game. They include all the standard potions, such as a potion of Strength, plus some non-standard ones like the Heal potion. * Voice effects: Recently received more than 80 voice recordings of things that the leading character will say from time to time, depending on his/her character class and what he/she is doing. * Bard song recordings: Nice progress on that front. When the Bard plays a song, a small clip will be played that depends on the selected song and the type of instrument he/she is using. * Help entries for character conditions: In progress, but the list of conditions is really long. It's a hassle to create the help entries but it needs to be done. * Spellcasting AI: In progress. Needs more testing, even though the AI is very deadly already. Also, more work needed on the spells that can be cast automatically after resting. * Website update: Just uploaded the latest versions of the web pages for Weapon enchantments, Feats, Wizard, Cleric, Druid and Psionicist. 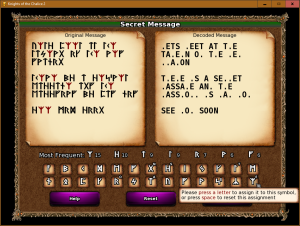 * Cryptography: I've added to the game a decoding interface used to decipher secret messages. Please see the screenshot below, click to enlarge and try to decipher the message . I think that this new interface can be very entertaining and it's a nice way of avoiding any excessive focus on fighting. For module creators, it's really easy to create a secret message in the editor. Any comments are welcome. Thank you for reading! Farewell, till next time! I really, really love the concept behind "Cryptography". The implementation seems to be superb too. It has a nice, nostalgic, retro feeling. 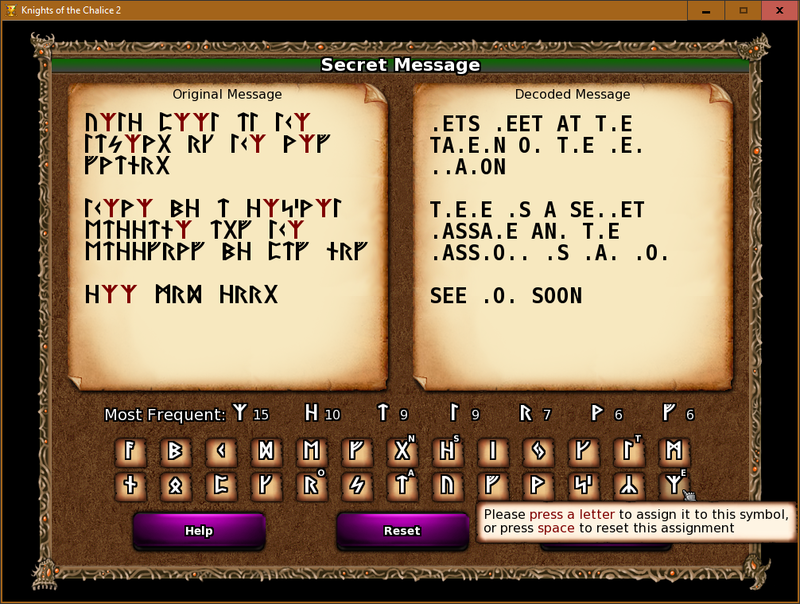 Decrypt-screen is nice and the massive amount of D&D features implemented is impressive! Hello everyone, I've just posted a massive update on KotC 2 development. Everyone can read the update, as it's not in the forum restricted to buyers. I hope you like it! Take care, until next time! Congrats are surely in order for this outstanding amount of progress this July Update showcases---wind in your sails! Hello everyone, I've just posted another massive update on KotC 2 development. Again, anyone can read the update, as it's not in the forum restricted to buyers. Take care all, and have a great time! PS. Thank you very much for your support, getter77. You are quite welcome Pierre---truly hoping KotC 2 can come through for you and greatly surpass the reception and performance of the original. Hello everyone, I've just posted the October 2018 update on KotC 2 development. Take care all, and have a splendid time! Take care and feel free to post comments and suggestions! Cheers! Any comments are welcome. Thank you for reading! Have a good time!